Unique designs, amazing quality, attention to detail! Rachel's designs are so beautiful and unique! She's extremely easy to work with and very responsive. My finance and I knew we wanted to go through a small business for our invites in order to have a design unlike anyone else and to be able to talk through what we wanted. Once we received our invites (sooner than promised! ), the quality of the paper and printing was outstanding. I'm so glad we went with Rachel! Rachel is amazing to work with and a very good communicator! Perfect vendor for unique invitations! Rachel was so helpful when designing our wedding invitations. She got an idea of what we were looking for, then sent us a number of designs for us to narrow down. We went through several rounds of proofs and she was so patient, responsive, and accommodating the whole time. We got tons of compliments on our invites from guests, would definitely recommend using Creative Freedom Designs for a custom and unique wedding invite! Rachel was so helpful and flexible with all my indecisiveness! She took the ideas in my head and made them even more beautiful! Between our seating chart, table numbers and invitations I am in love with her work! So many people commented on how stunning my invitations were. Rachel deserves all the credit for making them so extra special. I can’t thank her enough for putting her heart and soul into the design. I highly recommend Creative Freedom Designs for their expertise and quality service. Creative Freedom Design made designing the perfect wedding invitations easy and pain free. Rachel provided quality work in a quick manner and showed all costs upfront and during the design process. This was great because there were no surprises. We love our invitations and would highly recommend using Creative Freedom Design. Rachel is an amazingly talented designer with such a big heart and passion to create the perfect piece! I loved working with her to make my vision come to life. I would recommend Rachel for any of your design needs! Rachel, I can't thank you enough for your willingness and ability to help our family. You never hesitated to provide your services on such short notice and with such empathy and grace. Your creative design and execution of the beautiful acknowledgement and notecards captured the essence of CJ in such a memorable away. Thanks again for all of your help. I would highly recommend Rachel! She does beautiful custom work and listens to what you want! She created exactly what I was looking for! I had the most pleasant experience working with Rachel! She got the style and look I was going for and made it even better than I could have ever imagined! We went with an ombre style invite and she sent us multiple versions of the ombre to help us pick the perfect version as well as multiple versions of fonts and wording and was so easy to work with when making slight adjustments! The paper quality is great and the gold foil has such a beautiful look to it (all of our guest have LOVED our invites)! I would absolutely recommend any bride (or any party planner) to work with Rachel as she really is the best! I will definitely be ordering invitations from her for our next big celebration!! I cannot even begin to explain how amazing my experience was working with Rachel. 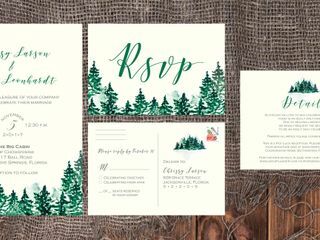 I was getting frustrated with the prices and the template designs online, and that's when I reached out to Rachel to create my custom invites. 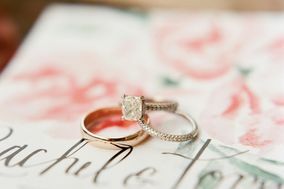 We had an initial call and she listened to my vision, asked thoughtful questions about our wedding day and brought everything and more that I imagined to life with her designs, all while helping me stay within my budget due to her creative suggestions! I made countless revisions and she was always so quick to respond and more than happy to make the changes. If you're looking for custom-made, fairly priced and excellent service, run don't walk to have Rachel handle all of your wedding stationary needs! Be specific in color and theme, and let Rachel run with it. I worked with her to create a simple, rustic rehearsal dinner invite and it turned out beautifully. LOVE LOVE LOVE her work! Rachel was exceptionally helpful throughout the entire design process. Any edits I requested were made and turned around quickly. She was also wonderful about trying out different styles (from flowers to fonts) until I found one I simply love! The invitations turned out lovely and are exactly what I wanted! Rachel is beyond talented! From the moment I contacted her to design our invites I knew I was working with a true professional. Attentive to my needs (and budget) she designed a beautiful invite that exceeded all expectations. Her work is completely personal and she was committed to ensuring I was completely satisfied with the finished product. I would highly recommend and would definitely use her services in the future. I ordered a custom design, and Rachel made exactly what I was hoping for! She was responsive, fast, and made changes when requested. I will use her again in the future. Highly recommend!